Looking to associate Leads or Contacts with a Salesforce Campaign? This document is for you! 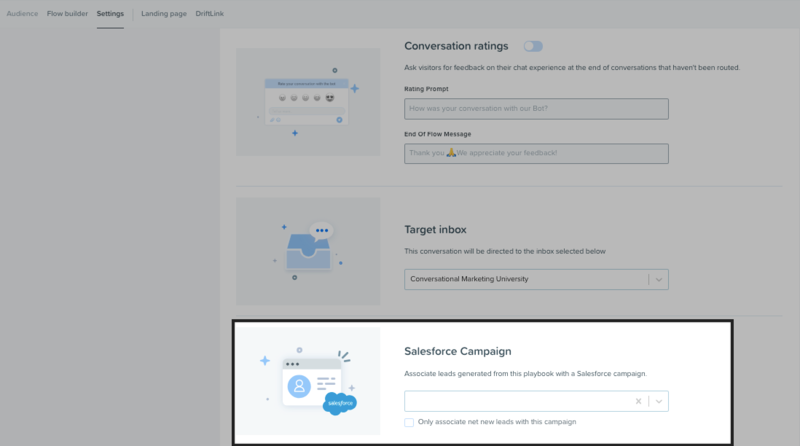 First, head over to your Salesforce settings within Drift! You can associate Leads and/or Contacts with a Salesforce Campaign under the Advanced Settings for each type of record. Below the "Set Lead Ownership" options, you can find a search bar for your Salesforce Campaigns. If the campaign names aren't in the dropdown, start typing - this is technically a search bar! If you would like all leads/contacts captured through Drift to attribute to a single campaign in SFDC, this is all you need to set up! We recommend setting up a default campaign within these settings as a catch-all for your Drift leads. That way, if you ever forget to set a campaign at the Playbook level, you'll still get some attribution on the Salesforce side! This setting is specifically tailored to companies using multiple campaigns to track inbound leads! In any bot Playbook, you can attribute all new contacts/leads with a specific Campaign from your Salesforce instance. Simply go into the desired Playbook, click "Settings" in the top navbar and you'll see a new space to attribute to a campaign! Type your existing campaign into the text field or select from the drop down! You can also set campaigns for your Welcome Messages and ABM Playbooks! Under Review, select Enable Playbook and you'll see a box to select or search for your desired campaign! For all Playbooks, you will need to select an existing campaign from the list. You can not create a new campaign from this screen. Please note, Playbook-level campaigns will take precedence over the campaign set in your Salesforce Sync Settings (described above). If a Playbook does not have a campaign set, it will use the default sync settings' campaign.